Are you looking for a smart way to use social channels for lead conversion? Are you tracking and leveraging your target customers’ path to buying your product? Collecting fans and followers is one thing, converting them to paying customers can be quite another. That is, unless you have a customized sales funnel in place. In this article you’ll discover how to put together a marketing and sales funnel with the right channels and key trackable metrics. You’ll also find advice on how to test and tweak your funnel for maximum boost. 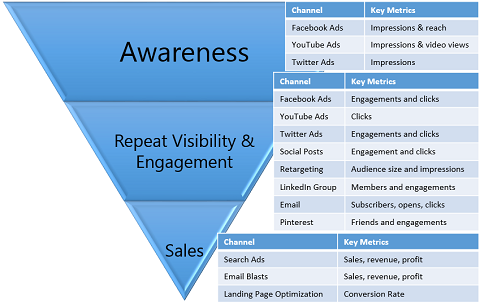 Why Is Your Marketing and Sales Funnel Such a Big Deal? Social media marketing is about using social networks and tools to guide prospects through a series of steps–a funnel–to get them to take the actions you want (e.g., becoming a fan, sharing their email address or buying your products or services). There are tons of social media tools, networks and options that include everything from Facebook and Twitter to landing pages and email marketing to SEO and ads. Each of these social marketing channels is one more way to guide your prospects through your sales funnel. Use varied social marketing channels to guide your prospects through your sales funnel. With all of these marketing channels at your disposal, how do you decide which ones fit within your sales funnel? To answer those questions, you have to know who your potential customers are and how you can reach them most effectively. You also have to know your company’s goals, how you’ll measure those goals (i.e., the metrics you’ll analyze) and what your target numbers are for those metrics. Every decision you make about how to create brand awareness, garner engagement and make conversions and sales should be a reflection of your funnel. The rest of this article shows you how to build, track and test your marketing and sales funnel to give your company the big results it wants. Did I mention you have a ton of social marketing tools at your disposal? Frankly, it can be overwhelming to think about using all of them at once as part of your marketing and sales funnel. So don’t. Start by determining what your high-level sales path should look like. 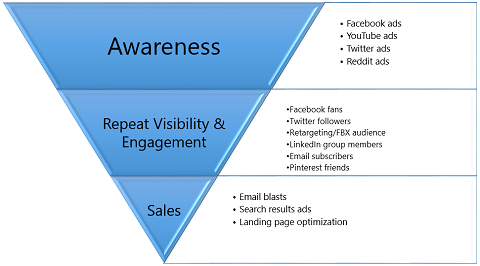 In the example a little further down, I’m using Awareness, Repeat Visibility and Engagement and Sales. Next, prioritize the social channels and tools your audience is already using and that you’re familiar with, then organize those by their primary function (or job). For example, Facebook is great for raising awareness and driving leads, but not for converting sales. Email blasts are excellent for conversions, but not awareness. As you’re deciding which marketing channels go where in your funnel, consider which ones are most relevant to your short-term and long-term goals, what each channel’s strengths and weaknesses are and what job you’re expecting that channel to do. Use your funnel to organize your channels and hold each accountable for its role in the process. Your funnel should be stable, but not inflexible. If your company cares more about email marketing than its number of followers, adjust your tactics accordingly. For example, instead of using Facebook ads to increase brand awareness and gain more fans, jump straight to an ad campaign targeted at list building. Create an ad that sends leads to an optimized landing page on your website where you ask them to share their email address to access content, a download, etc. Any bottlenecks in your funnel will slow your momentum or stop it completely. Depending on where the bottleneck happens, you could miss out on brand awareness opportunities, growing your owned media lists or conversions and sales. Set a key metric for each tactic in each part of your funnel to quickly diagnose where the funnel is anemic. With your key metrics in place, look at each tactic in each funnel section and set any industry benchmark standards. Use these benchmarks to compare your company to your competitors and your industry as a whole. How do you stack up? Look at which of your tactics and funnel sections are best or worst compared to industry averages and adjust as needed. Speaking of benchmarks and comparing, are you making the most of your analytics and tracking what you need to track? Awareness metrics, Facebook Insights and Google Analytics all have flaws, but I have a few tips for you. If you’re tracking awareness, I suggest looking at impressions instead of reach. Tools like AdWords don’t give reach data and Facebook’s reach data is inaccurate. Have you noticed that you’re getting inconsistent results from your Facebook Insights? Start exporting your Insights data to an Excel spreadsheet so you can consistently track and compare the right metrics and get a better idea of how your tactics are working long-term. 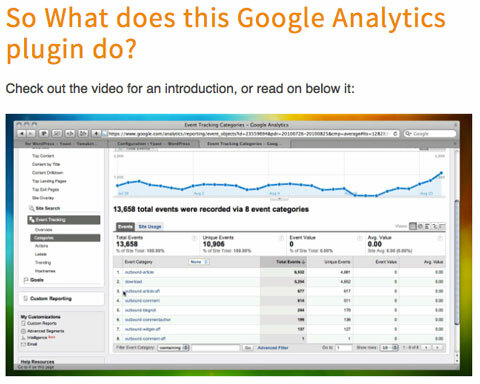 You’re probably using Google Analytics on your website, but if you’re not using the Google URL Builder or event tracking, you’re missing out on a lot of useful data. Google URL Builder allows you to customize URLs for posts and ads so you can track visitors from social networks and how they move through your site. Yoast’s Google Analytics WordPress plugin tracks events. Event tracking gives you information about button or link clicks, which is especially useful if customers have to go offsite to buy your product. If you have a WordPress site, you can even install this plugin that automatically creates event tracking for you! The number-one thing you can do to boost your results is test everything. Every good idea you think of is something to test. As you test, always think in terms of your key metrics and make use of your analytics to find out what works and what doesn’t. Let’s use Facebook as an example. You can constantly test your Facebook success by trying a variety of status updates. Which has the best engagement rate—photos, text, links or video? Does your audience prefer news or funny videos or memes? Take the time to analyze your previous and current posts to see what worked and what didn’t. If you want to find your engagement rate for a given post, I suggest dividing its total engagement (likes, shares, comments, clicks, etc.) by total post impressions. If you’re using Facebook ads, the Facebook ad display algorithm shows which posts get the most engagement. Pay attention to which posts your fans respond to. The key is to look at your best and your worst posts. In both instances, keep an eye out for differences in post type, topic, colors, sentiment, message and graphic style. What do your 10 most engaging posts have in common? What do your 10 least engaging posts have in common? Just knowing the commonalities of those top and bottom posts can help you dramatically boost your post engagement. When I went through this exercise for a client, their page had a month-over-month increase of seven times as many likes, comments and shares and 31 times as many link clicks! Are you using ads? Then you definitely need to be testing! Ads burn out fast, so it’s important to create and test ads weekly. If you have the budget for it, you can create, test and optimize new ads three times a week or more. If you’re using AdWords, create new ads until the point of diminishing returns. Check actual search phrases to see if you need more negative keywords. If your AdWords manager is slacking, get an AdWords Audit. 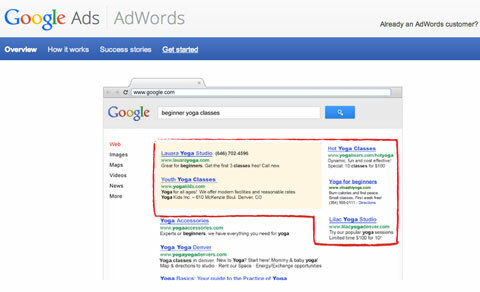 Do you use Google AdWords? Not sure which channel ads to spend money on? Compare your options. Run Facebook, Twitter and even Reddit ads to see which works best for your audience and gives you the best awareness or conversions for your money. A lot of brands use a content calendar to create a month of posts (for Facebook, Google+ or any other channel) ahead of time and then submit it for review. This seems organized and diligent, but in practice I believe this approach makes you less likely to improve your posts and get better results. Every month you need to analyze your key metrics and learn from any mistakes. It’s hard to implement those lessons when you’ve already assigned content for the next month (without the benefit of analysis). In place of content calendars, I recommend submitting examples of types of posts you want to test or creating your posts daily, or at least weekly. Customers like to make decisions on their own terms. In most cases, they’re looking for a relationship with a company, not necessarily a hard sell. You can use this human nature to your advantage. Take note of the social channels your audience is using most, then use those channels to guide them through your sales process. Set up a funnel that allows leads to jump in wherever they need to. If your funnel is stable but flexible, you’ll be able to adjust its use to fit your customers’ behaviors and needs—and make sales. Your biggest sales results will come from constant measuring and testing. Be prepared to make changes quickly and match your customers’ reactions to your efforts. You’ll be seeing intensified results in no time. What do you think? 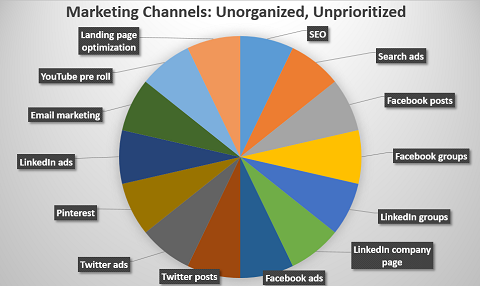 What channels does your funnel rely on the most? Do you have advice about metrics or testing? Share them with us in the comments. Brian Carter is author of the books The Like Economy and LinkedIn For Business, Brian has been marketing online since 1999. He speaks, consults, and is VP of Marketing for Infinigraph.